Elettromedia’s latest products were presented at the 2009 International Consumer Electronics Show (CES), Las Vegas, 8th january – 11th january, spreading a contagious enthusiasm, even among the most technologically demanding visitors. The Audison Bit One was the hit of the show: this signal interface processor created a big stir. The Bit One amazed visitors with its range of available functions and especially for its high acoustic quality. The two demo cars on display were both equipped with an audio system controlled by the Bit One with visitors having the opportunity to listen to its incredible performance. One of the cars was a 2008 Mercedes CLS 600, built by Steve Yi (Phoenix, Arizona) featuring Audison LRx amplifiers powering a complete Hertz Hi-Energy speaker system. The use of the Bit One processor enabled the creation of a high-end system, while maintaining the original OEM source unit. 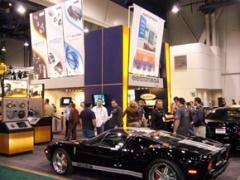 The installation for the second demo car, a 2006 Ford GT, was performed by Mobile Solutions (Calgary, Canada). The car was outfitted with a complete Audison Thesis system: TH 1.5 violino tweeter and the TH 6.5 sax woofer, powered by a Thesis TH Quattro amplifier. Everyone who listened to the two cars was very impressed with the results! In the area dedicated to the Hertz brand, the complete range of the new Hi-Energy line made its world wide debut: systems, components and subwoofers which mark a further evolution in Hertz technology and design. The Hertz section also presented innovation in the Energy line, featuring the new subwoofer enclosures and the new SPL Show subwoofers dedicated to the SPL project. Elettromedia organised highly specialised trainings for industry professionals in a reserved room. The trainings focused on the new Audison Thesis products and Bit One, explaining their technical aspects in detail: Audison engineers elaborated the advanced multi-media presentation.